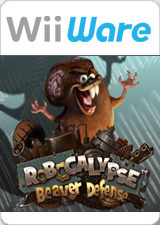 Penned by the writers of the tongue-in-cheek SpongeBob Squarepants series, Robocalypse: Beaver Defense offers madcap weaponry and uproarious destruction in a "tower defense" style game. Set in a world of wise-cracking, battling robots, players must create and strategically position static and mobile defenses to stop the waves of enemies that are intent on destroying the player's HQ. Place defenses before the start of each level and prepare for the enemy's onslaught! Each successive wave of enemies is tougher, so the choice and positioning of defenses is essential. The graph below charts the compatibility with Robocalypse: Beaver Defense since Dolphin's 2.0 release, listing revisions only where a compatibility change occurred. This page was last edited on 22 January 2018, at 09:24.